This book addresses the challenges of international intervention in violent conflicts and its impact on groups in conflict. When the international community intervenes in a violent internal conflict, intervening powers may harden divisions, constructing walls between groups, or they may foster transformation, soften barriers and build bridges between conflicting groups. This book examines the different types of external processes and their respective contributions to softening or hardening divisions between conflicting groups. It also analyses the types of conflict resolution strategies, including integration, accommodation and partitioning, and investigates the conditions under which the international community decides to pursue a particular strategy, and how the different strategies contribute to solidification or transformation of group identities. 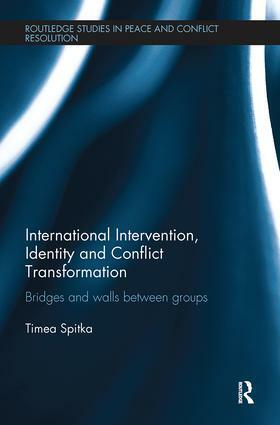 The author uses three case studies, Bosnia and Herzegovina (BiH), Northern Ireland and Israel-Palestine, to reveal how different types of external interventions impact on the identities of conflicting groups. The volume seeks to address how states and international organizations ought to intervene in order to stimulate the building of bridges rather than walls between conflicting groups. In doing so, the book sheds light on some of the pitfalls in international interventions and highlights the importance of united external process and inclusive identity strategies that promote transformation and bridge differences between conflicting groups. This book will be of much interest to students of intervention, peace and conflict studies, ethnic conflict, security studies and IR. Timea Spitka is Sophie Davis Postdoctoral Fellow in Gender, Conflict Resolution and Peace at the Hebrew University, Israel, and has a PhD in International Relations.